Lakes Garage Doors distributors of an extensive range of aluminium front doors. Our main product, the Groke aluminium door, is one of the best available. If you are looking to purchase an aluminium front door which will not only enhance your property but offer a high level of security, the range available from Groke is going to be the best option for you. Groke aluminium front doors are manufactured from a hot-insulated aluminium profile. This ensures the doors offer an extremely strong and rigid frame and also, a significant level of insulation. 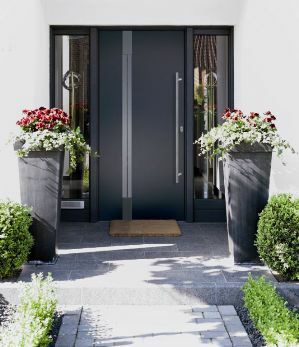 Over 100 years experience offering a range of metalwork products has put Groke are in a position to create, what we believe, are the best aluminium front doors on the market. We pride ourselves on working closely with Groke to sell these fantastic products and are pleased also to be able to offer a free site survey. One of our engineers will visit you at your property and talk with you about your individual needs and requirements. Once you decide to proceed with the purchase of a Groke aluminium front door, you will receive a CAD scale drawing of the finished door. The door will be made for you, based on your requirements and installed by our expert engineers. There are no standard sizes of Groke aluminium front doors. Whichever model you choose from the fantastic range, you can rest assured, it will perfectly fit your property. In addition to the design and fit, you are able to choose the level of insulation on your door; either 34mm, 44mm or 94mm. As the cost of energy and fuel rises, it makes sense to consider a greater thickness of insulation than you perhaps would and, in many cases, the cost of the door will be paid for through energy savings in years to come. You are able to choose the colour of your aluminium front door. All doors from Groke can be painted in any colour on the RAL chart. Firstly, you can choose the door frame which perfectly matches your needs and requirements. 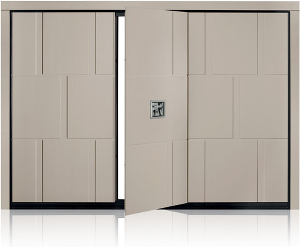 All Groke doors are available with either Symponie (rounded edges) or Arcade frames (a flush finish). Secondly, you choose the furniture which best meets your personal tastes. Door handles, as an example, are available in long, short, straight or curved options to ensure your door looks just as you want it to. Finally, you can choose the glass which best meets your requirements. Groke aluminium front doors are available with either plain, etched or security glass. If you want to let the maximum level of light into your property, opt for plain glass. For a little more privacy yet still a relatively high level of light let, opt for etched glass. For the ultimate level of security, choose security glass. Unlike many euro profile locks, which can be easily drilled with a cheap cordless drill, Groke aluminium front doors come as standard with an anti-drill lock. Hinge bolts prevent the door leaf from being lifted off its hinges. Without these, a crow bar could forced between the door leaf and threshold to allow entry to your home. Hinge bolts give you peace of mind..
As standard, Groke aluminium front doors have 3 point locking. Other options are available. If you wish to secure your property even further you can have up to 17 point locking. With automated locking, the door lock is operated by a handset as is the case with automated garage doors and automatic gates. This offers the perfect solution in instances where you need to open the door when your hands are full or you need easy access. When the door is closed, Groke’s automated locking system will lock itself which gives you peace of mind that you can never leave your door unlocked. An option on Groke’s aluminium front doors is to have a TOCA fingerprint locking system in place…you can never lose your keys again! The system accepts up to 99 finger prints allowing the biggest of families to scan more than one finger just in case! Lakes Doors now have a Groke door on display at our Garstang showroom near Preston. This door is complete with biometric locking. Call us!